Sonarworks Reference 4 comes hot off the back of the company’s standardization announcement, and we managed to get our hands on this unique system. Sonarworks Reference 4 is a digital room correction and acoustic calibration system, that uses a purpose-built analysis microphone to accurately capture the frequency response of your room and monitors. 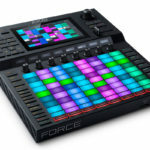 The system comes with an audio plugin you can load up in your DAW, and a standalone application that corrects all the audio that passes through your system, whether you’re streaming from YouTube, Spotify or just a media player. 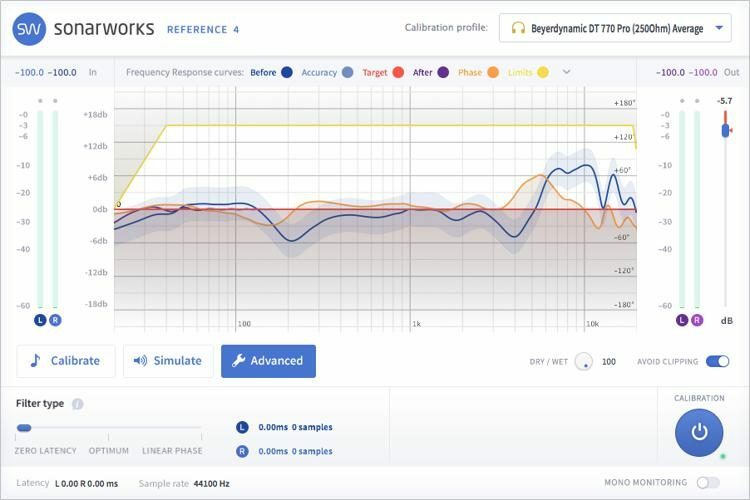 Sonarworks Reference 4 uses an intricate algorithm to apply changes in the frequency response of your system resulting in a flat frequency response curve. I’ve had the luxury of experiencing a few high-end monitoring and studio setups. Straight after calibrating the system and turning it on, I could immediately tell I was closer to that professional accurate sound than I had ever been before. 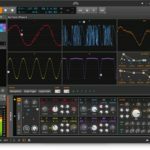 Sonarworks Reference 4 has a plethora of tools for tailoring your sound to suit your needs. From predefined industry standard target curves, to hundreds of frequency response curves for industry leading headphone models. The calibration and usage of the system is incredibly straightforward. There is an onscreen guide that talks you through the entire process, making it easier. The amount of time and money you would spend using traditional acoustic treatment far exceeds the price of the Sonarworks Reference 4 system. Sonarworks Reference 4 comes in various shapes and sizes, whether you’re looking for a system to calibrate your specific model of headphones, or the full-on room and speaker correction system. 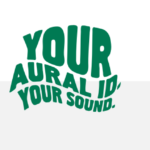 They also offer an upgrade package from the “headphone” version to the “studio” version. This is great for guys who are starting out who don’t necessarily have studio monitors yet, but they’re planning on upgrading in the future – they can guarantee an accurate translation of their mix between headphones and speakers. Each Sonarworks XREF20 calibration mic is tested to maintain utmost precision, and the ID of the specific microphone you receive in the bundle is punched in during the installation process to make sure the system understands the frequency response of your exact microphone. 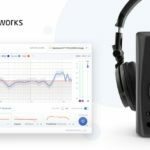 The Sonarworks web store even offers some industry leading headphone models, that come with a unique calibration chart for that specific pair of headphones! Sonarworks Reference 4 levels the playing field, it allows beginners a similar level of acoustic accuracy as their most revered producers and engineers. 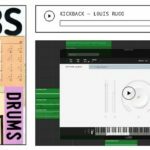 This allows you to accurately reference how their tracks are mixed, and also gives you the opportunity to hear problematic frequencies in your mix – without having to invest in studio time in a professional studio or your own acoustic treatment. The calibration process is so easy and takes all of around 20 minutes. In fact, it’s pretty fun to see in action. Using the reference microphone, you’re able to pinpoint the problem areas in your room and assess a plan to correct those areas with actual acoustic treatment – and then re-apply the calibration process, for the ultimate accuracy. 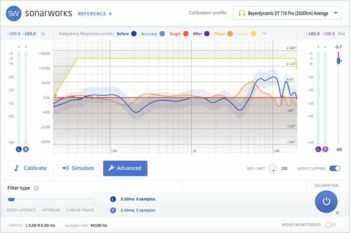 The Sonarworks system allows you to save and recall multiple room calibration curves – this is particularly handy for engineers who work studio day jobs or multiple studios and want to be able to achieve the same accuracy wherever they are and whatever monitoring setup they have, be it speakers or headphones. Not only does Reference 4 simulate a flat-frequency response room, it allows you to choose from some predefined industry standard calibration curves for various Hi-Fi speaker emulations. This is particularly handy for quickly referencing your mix on various different simulated setups. There are also various configuration controls within Sonarworks Reference 4, allowing you to tailor the system to fit your specific needs. You can tone down the amount of correction applied, choose to extend or boost low frequencies, or adjust your listening position. For the discerning listeners, there is a Linear Phase mode which ensures the ultimate accuracy through time-accurate filtering techniques. Sonarworks Reference 4 is great for performers and producers on-the-go, like mentioned above, you’re able to achieve the same sonic accuracy in your home studio as you are in headphones on a tour bus or airplane. You’re able to calibrate the system to work in Zero Latency mode, great for musicians who want an accurate monitor for live instruments. Sonarworks doesn’t just make a system for high-end users, they offer an app for the more discerning audiophiles too. 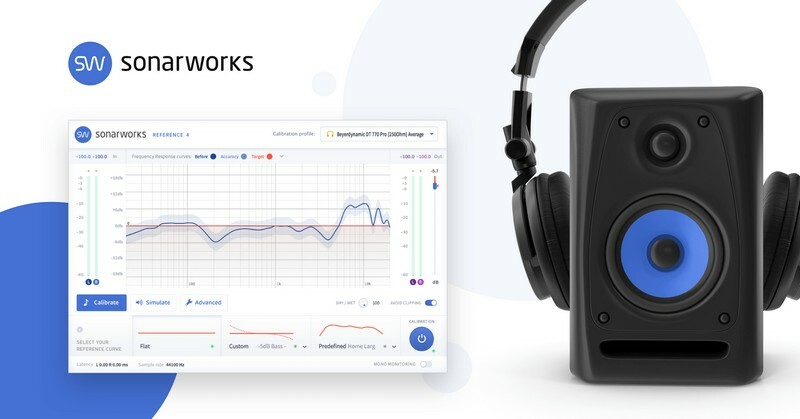 Sonarworks True-Fi is a desktop application designed to give you the most out of your headphones, it aims at correcting the differences in frequency response that so many headphones have. Sonarworks Reference 4 Studio Edition performs best when used in combination with basic acoustic treatment - although it’s an easy way to see what treatment needs to be applied. Sonarworks is an exceptional system, it is personally one of the biggest steps I have had in audio quality since first getting into the game. I would say to get the most out of your system, it would be best to use Sonarworks Reference 4 Studio Edition, alongside a basic acoustic treatment setup – that way the Sonarworks system is only evening the gaps rather than making up for huge problem areas. That being said, thanks to the calibration system – I now know what areas of my studio need work in terms of adding some bass traps and mid-range treatment.